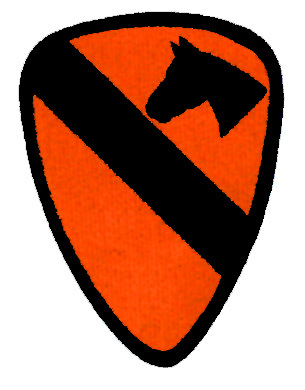 The patch of the First Air Cavalry Division is the largest and most brilliant in the army. It is here shown in its actual size. It was said that in the Cav the patch was not sewn on the sleeve, but the sleeve was sewn on the patch. Ignorant detractors looking for a fight would say of the components of our patch, "That's the horse you never rode; that's the river you never crossed; and the yellow stands for itself." Needless to say, no person of quality has ever subscribed to this view. (The horse stands for cavalry, yellow being its traditional color [blue: infantry, red: artillery]; perhaps the bar stands for itself as the Cav's watering hole.) As it happens, the bar actually represents the baldric, a strap worn crosswise designed to secure a sabre or pistol. In the field, the orange of the patch was replaced with the same shade of olive drab found in the jungle fatigue uniform. This is because its luminescent orange makes the wearer a conspicuous target.